A lot of wakeboard schools have come and gone over the years, but only The Wakeboard Camp has prospered and ultimately become the leader. 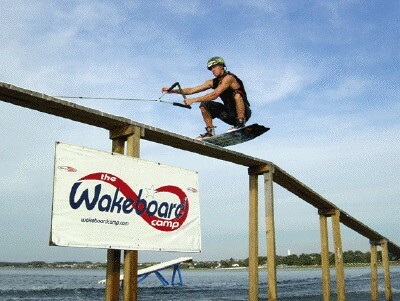 TWC was specifically set up as a wakeboard camp. This isn’t another one of those backyard deals and we are not part of a ski school. We have taught nothing but wakeboarding, wakeskating and wakesurfing since 1996. Weekly sessions run year round, are all inclusive and for all levels of riders. We have the best coaches, an awesome lakefront facility, great food, the best wakeboarding boats from Malibu and a full line of wakeboards and wakeskates from the world-wide leader in wakeboard manufacturing, Hyperlite. We hope you can make it down to experience the ulitmate week in wakeboarding in the wakeboarding capital of the world, Clermont, Florida. I haven't actually been to the Wakeboard Camp as an official camper, but I visited the camp site and rode there while in Florida for Expo. The facilities are cool, the location is great, and there are plenty of obstacles for mixing it up. The coaches are also outstanding, some of the best in the business. That was one of the best week I ever had, I learned so much, it's totally crazy... I want to go back, btu I'm still too broke... (Hell I'm still repaying that trip!) Anyway, to anyone that got the cash the tremendously imporove their riding. I reccommend TWC! Anyway, the instruction is great and the facility is good. I highly recommend going. Also, check out "The Book" DVD series. Great stuff in there.